Contribution to TT: Andy Millar; Weymouth League. Gemma Parry, Table Tennis England’s Volunteering and Development Officer (South West) and part of the Women and Girls’ working group, discovers how one league is utilising the Young Ambassadors Programme to encourage more people to pickup table tennis – and to help fill a gap in coaching provision. Andy found himself in a situation I hear about quite a lot as a Development Officer, and it’s that of not having access to enough coaches to support the local demand for table tennis. He has tried again and again to source individuals who are both motivated to want to coach and also give us some of their free time, to then source local coaching courses, only to get people trained up and have to leave the league for a variety of reasons. As we know, this process isn’t a quick process either, and thus instead of continuing to get frustrated by this he decided to try a different approach. “When I saw the promotion of the Table Tennis England Young Ambassador Scheme, I thought it was a great idea. “Who better to inspire young players that those who have been in that position before? “Several young players jumped at the chance for various reasons from getting coaching experiences to giving something back. “We have several young volunteers at the club now and three of them are now a part of the TTE Young Ambassadors Scheme. “Some of the volunteers assist my sparring and others are general helpers at my sessions.” I was really excited to then get to meet some of the Young Ambassadors and see them in action. When the Sport England ‘This Girl Can’ campaign was launched a few years ago Andy saw this as a fantastic opportunity to showcase what the league can do and took the opportunity to launch a 6 week ‘This Girl Can’ campaign where women and girls of all ages could take part in a totally recreational session. He was bowled over when 60 women and girls came to his first session. The drop off rate was extremely small and he struck a real cord in providing what local women and girls were looking for. Why do I mention this? Because one of the Young Ambassadors at the session attended those sessions with her mum…. Her Mum who then invited her friend…. who then brought her daughter. Which was the starting point of a process which, two years later, as I walked into a sports hall at a Community College in Weymouth, has breed a weekly women & girls’ session for the Weymouth League which was five tables full with two Young Ambassador’s supporting the running of the session. When I say supporting, they could have run it all on their own! Any time the volunteers were free the young people wanted to hit against them, and Andy knows just how powerful it is for the younger players to have the older players to look up to. I was bowled away by what the league have achieved and development with their Young Ambassadors and volunteers, by also in the attention to detail and development that the league has put into its young people and programmes to get it to where it was when I visited. A very big well done to Andy Millar and the Weymouth League Committee – and to Sophie and Holly who are two very inspiring table tennis players and volunteers. To: Every Individual Company Member, County Representative Company Member and League Representative Company Member. The next Annual General Meeting will take place at the Jurys Inn Hinckley Island, Watling Street, Hinckley, LE10 3JA; commencing at 2pm. Voting Members have the right to submit propositions to the AGM. Those propositions can come in two different forms – special resolutions to amend the articles of association (requiring 75%) and ordinary resolutions on other matters (requiring a simple majority). email to sandra.pelizzoni@tabletennisengland.co.uk by the dates set out above. Anyone is welcome to attend the AGM and can ask a question at the meeting, however this needs to be submitted beforehand to the Office Administrator. During the voting section, only Company Members are entitled to participate. Sophie Barcsai won two titles at the Welsh National Championships in Cardiff on the 2nd-3rd March. She is National Champion at U11 and U13 (dropping only one end in both of these events). Also she was in the Semis of the Cadets (under 15's) which was won by Anna Hursey. In the Irish Nationals which took place at the same time, 12 year old Emily Flynn, who has trained at Bournemouth in preparation for this event, dominated, beating all other 8 contenders to become Irish National U13 Champion. Our own Hannah Hicks competing in the English Nationals, despite hardly training over the last 6 months came away with a Bronze Medal losing only to Tin Tin Ho in the Semis. Perry & Ware Easter Camp 2019. Nine-year-old Sophie Barcsai brilliantly defeated the top seed and team gold medallist Gaetane Bled of France as she claimed a bronze medal at the Hungarian Mini-Cadet Open. Representing Bournemouth TTC and England in the Under-11 singles, Barcsai got through her group with three wins from three, defeating Sofia Kapilova of Belarus 3-0 and Elena Schinko (Austria) and Denisa Cotruta (Germany) both 3-1. In the last 16, Barcsai overcame Josephina Neumann of Germany 3-0 (13-11, 11-9, 11-2), so set up a quarter-final against Bled. And Barcsai pulled off a superb performance to win 3-2 (10-12, 11-4, 11-8, 5-11, 11-9) against an opponent who had blitzed her previous matches for the loss of a handful of points and who was part of the France line-up which won team gold. Barcsai’s run ended in the semi-finals as she was defeated 3-2 (8-11, 10-12, 11-8, 11-2, 11-3) by Faustyna Stefanska of Germany, who went on to win gold. In the team event, Barcsai played alongside Ivett Szerbacsics of Hungary but the girls were unable to make it into the main draw as they were defeated 3-2 by a Romanian team, 3-0 by a German pair and 3-1 by another German combination – He TTV II – despite Barcsai beating Hannah Kriebbach 3-2 (11-13, 11-3, 8-11, 11-2, 11-6) to make it 1-1 in the final match. She also won one of her singles matches against the Romanian team. The girls made it through to the final of the consolation event – effectively a play-off for 17th and 18th positions, where they were beaten by the same He TTV II line-up. Joseph Hunter, representing Urban TTC and England in the Under-13 boys, finished second in his group thanks to 3-1 wins over both Tamas Kajcsa of Hungary and Rafael Russo of France. He was narrowly beaten 3-2 by Hungary’s Balazs Voros in the other group match. In the last 32, he beat Wei Chen Yu of Hungary 3-2 (4-11, 11-5, 11-7, 8-11, 11-8) and then advanced to the quarter-finals with a 3-1 (8-11, 13-11, 11-8, 12-10) victory over Maximilian Breher of Germany. His run ended in the quarters, where he was defeated 3-1 (11-5, 6-11, 11-5, 11-6) by David Szantosi of the host nation. Charlie Nabarro, also of Urban TTC, finished third in his group, registering a 3-0 (11-4, 11-9, 11-8) victory over Peter Bota of Hungary. Nabarro then won his last-16 match in the consolation event, defeating Johannes Gronborg of Denmark 3-0 (12-10, 11-4, 13-11). He was defeated in the quarter-finals by Eduard Simonian of Bulgaria, who won 3-2 (7-11, 7-11, 11-4, 11-8, 11-9). Entry is now open for the South West Inter Regional Qualification Tournament being held on Sunday March 17th at the Joola Plymouth Table Tennis Centre. This is in effect the South West Championships for Girls and boys in the U11, U13 and U15 age groups. It is a two star tournament and one of the best events in the region's calendar. Please find attached this weeks practice schedule and news updates. Please note that next Saturdays practice session is a 3 hour match-play session for Beginners/NCL/NJL squads between 10am and 1pm. More details attached. This weeks practice updates include details of the current Monday Junior League positions, free girls promotion and Monday/Saturday discounted session price news. The competition updates include NCL and county team updates. Please pass this to anyone who may be interested in starting or returning to play table tennis. This includes youth and adult players. There are lots of opportunities to play, both competitively and socially. 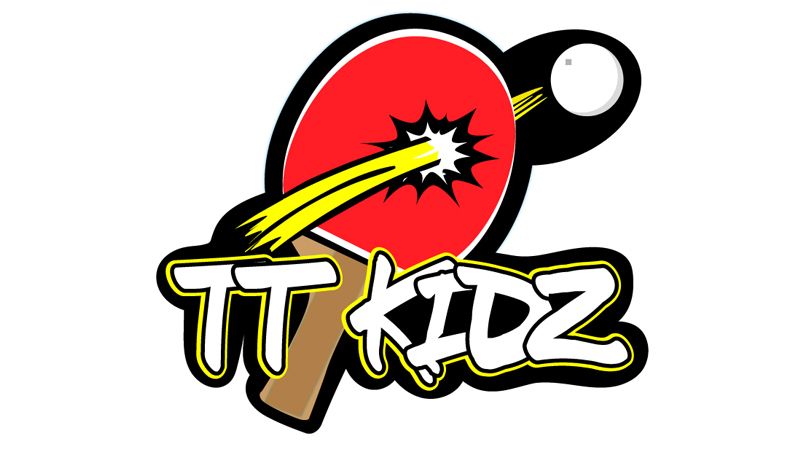 TT Kidz has been unveiled as the name for our new youth product launching next year – and clubs have the chance to find out all about it by joining a special webinar next month. The name and logo were selected following lengthy consultation with young people, parents, schools and our members. Out of a choice of six names and logos, more than 75% of hundreds of seven-to-11-year-olds and more than 50% of adults preferred TT Kidz. We are now consulting with teachers and coaches to put together a series of sessions designed to enthuse young players. The programme will be launched at the National Conference on the weekend of March 30-31, 2019. Pilot projects will test the sessions from April 2019 onwards and we will be inviting clubs across the country to begin to deliver TT Kidz from September 2019. But before then, you can hear more about the plans and how your club can get involved by signing up to join our webinar between 7.30pm and 9pm on Monday December 10. During the webinar – an online seminar – you will be able to see and hear about the plans, as well as post questions or comments, which we will be able to answer during the session. o sign up, please fill in your details at the bottom of the page and we will send you the details of how to join the webinar a few days before. To view what is happening at TTE & any Documents; Go to the "TTE Documents" page of this website; especially with regard to 'League Manager' format for future seasons. Please return Entry Forms by e-mail to myself no later than Tuesday 30th October and Please Post Cheque to Matt Ware Flat 5, 40 Stirling Road, Talbot Woods, Bournemouth, Dorset BH3 7JQ. Look forward to seeing you all in November. The new membership year is upon us, meaning it is time for players to renew their memberships and licences for the 2018/19 season. As recommended by the Board and approved at the AGM, Player Membership will cost £16 for Seniors and £8 Cadets or Juniors. Player Licence is priced at £38 for Seniors and £19 for Cadets or Juniors. Associate Membership will remain FREE of charge. As a reminder, associate members are not eligible to play competitive table tennis, but can play at their clubs or socially. Although membership fees are rising – so too is the amount of money and staff resources being spent on grassroots table tennis. Last year we put £870,250 directly into grass roots table tennis – this year we intend to spend £926,659. So for every £1 of membership fee income received we are spending another £2 on grassroots table tennis. Our focus more than ever is on the player and the enablers – clubs, coaches, volunteers and leagues – around them to ensure members get the most out of their affiliation with us. Members are the lifeblood of our sport, and both consciously and subconsciously they provide a position contribution that helps makes this great game develop, grow and be successful. To help you get the most out of your membership, we’ve put together a ‘Guide to Your Membership with Table Tennis England’. It includes the benefits your membership brings, which can help you save more money than your membership cost, and it also lets you know what we will be doing for grassroots sports over the next 12 month. Click here to view the guide. What will we be doing for grass roots in 2018/19? This year just under £1million will be invested in grass roots sport by Table Tennis England – an increase on the previous year. Phase two of our clubs and league development programme, Be TT, will take place. In the coming season we expect to support 36 clubs and 19 leagues with funding and programme support towards three targeted areas; shorter format leagues; women and girls participation and adult coaching. We’ll launch this product aimed at getting 35-50-year-olds back into the game. It is the result of extensive research into the sport and competitive play patterns. We will work with clubs to roll out Bat & Chat – our newly launched programme aimed at the 55+ market. We will launch a new digital software package for clubs to provide a time saving and simplified solution for their day-to-day running, including management for: registrations, memberships, resource access, coaching and competitions. We will run a pilot phase of a new youth product aimed at encouraging young people to play table tennis for the long term. This will primarily be delivered by clubs, with Table Tennis England providing both operational and marketing support. The first new format Level 1 coaching course will take place, aimed at attracting more coaches to the game. The new format includes a reduction from three days of practical to two, and the introduction of online learning to make it more accessible. A new, monthly member-only email providing you with coaching tips tailored to your skill level, access to exclusive competitions and statistics on how you’re performing this season. To find out more about what we are doing and where funding goes, view our Guide to Your Membership. The easiest way for players to purchase their membership is by direct debit. Payment will automatically be debited from the players account on an annual basis, to save the inconvenience of manually completing payment each year. To purchase your membership for 2018/19 season please go to your membership login page. Want to renew by telephone? Please note that membership and renewals for the 2018/19 season are currently available online only. Telephone renewals will be available from Wednesday August 1, 2018. The 2017/18 season was a fantastic year for table tennis in England. Take a look back over the past 12 months and relive the season’s highlights. KATIE Holt was the toast of Dorset after winning gold and silver medals at the Butterfly Schools’ International Table Tennis Championship in Worcester. The 15-year-old, representing England A, partnered London Academy's Patricia Ianau to a 3-2 victory over England B in the intermediate girls' team event. And the teenager, a pupil at Bournemouth School for Girls who trains at the Dorset Table Tennis Centre in Christchurch, was runner-up in the singles. Holt and Ianau saw off competition from Scotland ,Wales, Ireland, Guernsey and Isle of Man to emerge victorious in the team event. Buoyed by her gold medal, Holt won all her group games in the singles and progressed through to the knockout stages, beating Scotland's Wictoria Smolarek 3-1 in the first round. She had a big test in the quarter-final where she really had to dig in against Scotland's number one cadet Faye Leggett, eventually triumphing 3-2 (11-7, 11-9, 9-11, 8-11, 14-12) after it seemed the chance had gone. Holt, who is coached by ex-England international Matt Ware, then eliminated close friend and England team-mate Gemma Kerr 3-0 (11-9, 11-5, 11-8) in the semi-finals. She made an encouraging start in the final against Mia O’Rahilly Egan and took the opening set 11-2. But despite having beaten O’Rahilly Egan in the team event, the Ireland youngster hit back to take the title 3-1 (2-11, 11-9, 11-8, 11-7), forcing Holt to settle for silver. O’Rahilly Egan had been a serial destroyer of English hopes as she defeated the Ianau sisters in successive rounds – Natalia in the quarters 3-1 (9-11, 11-8, 11-4, 11-7) and Patricia in the semis 3-2 (11-9, 3-11, 11-8, 8-11, 11-4) before seeing off Holt. There was a special presentation to former English Schools' Table Tennis Association president John Arnold MBE and his wife Margaret, who have given more than 50 years of service to schools’ table tennis. John Arnold oversaw the merger between ESTTA and Table Tennis England and retired following the event. While England’s footballers were tackling Sweden in the World Cup quarter-finals, it was Surrey and Sussex who kicked off an initiative involving their younger cadets from the age of just eight. Friendly county matches were arranged primarily for the counties’ relatively inexperienced potential. The underlying criteria was to introduce young players who had not previously participated in the County Championships. When these young players do eventually officially represent their county it is hoped they will not be overawed by the experience. The friendlies also gave the counties’ coaches some pointers on where to focus their attention next. The intention is that these friendly matches will be backed up by some joint coaching sessions which are planned to involve Surrey, Sussex and, in due course, Kent players, the constituent counties of the South East region. Whilst the initiative is still in its infancy it is hoped it will lead to bigger and better opportunities for the region in the not too distant future. The results saw Surrey A beat Sussex A 8-2, while Surrey B and Sussex B drew 5-5. Sussex A took consolation in beating Surrey B 6-4 and Surrey A beat Sussex B 8-2. To end the day, Surrey A beat Surrey B 9-1. Stand-out performances for Sussex came from John Strang (4/4) and Harry Yip (4/4) while for Surrey it was Jacob Archer (4/4) and Ojay Borah (3/4) with the girls Naziyah Hasan winning 6/6 and Caron Charles 5/6. Please note that only Under 15 & Under 18 players can take part in this event. No need to enter just turn up and compete. Results from this competition will then form teams selected to represent Dorset. This year we have 4 teams (2 cadet & 2 Junior) each team consists of 3 boys and 2 girls. The trials we start at 6.30 pm and will finish around 9pm. Cost is £5 per player. Just another reminder that myself and 5 times national champion Alex Perry are holding a summer training camp in late August (please see poster for more details) the perfect way to get in shape for the county trials in September. So you are aware, I am leaving Table Tennis England on the 27th July to relocate to the East of the country. After this date, I would suggest contacting Chris Brown chris.brown@tabletennisengland.co.uk who is the South area lead. Table Tennis England membership fees for 2018/19 have been approved at the AGM. Player Membership will cost £16 for Seniors and £8 for Cadets or Juniors and the Player Licence will cost £38 for adults and £19 for juniors and cadets. Associate Membership will continue to be free of charge. This rise, which equates to £2 for Seniors and £1 for Cadets and Juniors, is in line with a five-year strategy. Details of how to join Table Tennis England for the 2018/19 season, plus the raft of membership benefits on offer, will be published in the coming days. In addition, a special award was presented to Mark Taffler for his contribution to England staging the ITTF Team World Cup. Table Tennis England’s Annual General Meeting and Conference takes place this Saturday with some important updates. Taking place on Saturday, July 7 at Jurys Inn Hinckley Island Hotel, Hinckley, the day will begin with an update on Table Tennis England’s governance review. Run by an Independent Review Panel (IRP), the review was launched to allow Table Tennis England to listen to the views of members whilst remaining in compliance with the code of governance. This weekend, the IRP will present its final report from phase one and hold a Q&A session. A copy of the final report can be found in the attachments below, along with a copy of the Board’s response to the report. Among the recommendations is the creation of a Membership Advisory Group that would provide expert advice from all areas of the sport. The AGM itself will begin at 2pm and will include the proposed affiliation fee rise for 2018/19. Player Membership: £16 for adults; £8 for cadets & juniors. Associate Membership: free of charge. 11.00 – 12.00 Presentation from Table Tennis England Members of the IRP – Q&As. 12.00 – 13.00 Annual Review; 13.00 -14.00 Lunch; 14.00 – 15.00 AGM ; 15.00 – 16.00 Honours Presentation. Please notify Reinhard Lindner (Secretary) of unavailability at :- secretary.mertonttc@talktalk.net. We will again be running the Cadet Invitation Tournament this year, it will be the 24th year it has been organised and has some great names to aspire to including David McBeath ( current National Champion and England Senior International ) and Matt Ware to name but a few. Last year's Tournament was a great success and enjoyed by all, I personally spoke to every player when they had finished and they all enjoyed a well-run event that gave them many games throughout the day. There is no entry fee for the event thanks to another year of generous sponsorship. Entries must be received by post or e mail by 14th July at the latest as per entry form attached and no entries will be received on the day as the draw will take place on Tuesday 17th July. This is a great end of season event and is open to Boys and Girls of all standards. There will be a main event for the more experienced players along with a Tyro event for the less experienced players. After the group stages players will be split into later stages where a plate competition will also take place in both events. There will be a separate Girls event and the format will depend on entry numbers. Can I please ask you all to circulate the attached entry form to all your Cadet eligible players ( born after 01/01/2003 ) and encourage them to play and get their entries in early to avoid disappointment. Former England junior international George Downing (Bournemouth) won the Peterborough 'chip & ping' senior 1* ratings tournament held at TOP TABLE, Peterborough on Sunday 10th June. Unbeaten on the day, 23-year-old Downing (England No 32) claimed the title ahead of runner-up, local favourite Adam Jepson (who only lost one match - to Downing) in a keenly contested open tournament. This inaugural senior tournament was well attended and featured players from as far afield as Cheshire, Dorset, Lincolnshire, Bedfordshire, Northamptonshire, Yorkshire as well as Cambridgeshire. Apart from Jepson, other 'home' Archway players who impressed were Joe Killoran (fourth), Steven Gray (fifth) and youngster Jakub Kurowski (seventh). Organiser Steve Williams said: "Congratulations to George, who despite being favourite, beat a number of England ranked players. Also, considering it was our first senior open tournament we were delighted with the quality and number of players who competed." Bournemouth "Echo" Report :- TTE "Junior National Cup"
FERNDOWN’S Katie Holt sealed sixth spot as she took on some of the best players in the country at the Junior National Cup. The event saw 10 of the highest-ranked young players invited by Table Tennis England to compete against each other on a round-robin basis. The Bournemouth School for Girls pupil was ranked fifth and got off to a great start by beating third seed and eventual bronze medallist Sarah Menghistab 4-2. She won a further three matches, though a 4-3 upset defeat by ninth-ranked Amelia Chan contributed to her finishing one place below her seeding in sixth. He was unable to convert performances into wins until his fifth match, when he defeated 10th seed Artur Veeck-Caltabiano 4-1. On the second day, he beat ninth-ranked Sam Chesterman but his best performance saw him defeat fifth seed Naphat Boonyaprapa 4-3 in the penultimate round. The 17-year-old said: “The first day was difficult, I really struggled to get used to the conditions, which were quite hot and I think I was a bit scared to win matches. Table Tennis England has teamed up with Ping Pong Fight Club to promote female participation in the sport. Together the two companies are working to support, develop and encourage all-women teams to take up table tennis and compete on behalf of their companies across the country. The popularity of ping pong has been growing in workplaces across England over recent years, helped along by Table Tennis England’s Loop At Work programme, which makes it easier to bring social table tennis into the workplace. Through this new partnership, it is hoped that even more women, who may have avoided playing in the past, will gain the confidence to pick up a paddle at Ping Pong Fight Club and then back at their office ping pong table. As part of this new partnership, free, professional coaching sessions will be delivered at the offices of the all-women’s teams, teaching them to play from scratch and enjoy the game from the very first ball hit. Engaging more women and girls is one of our sport’s priorities and we are working hard with a range of partners to ensure more opportunities are available to them. “Fight Club events are perfect for promoting table tennis to a female audience, as they are such great fun and women can join in without even thinking about some of the things that might normally stop them playing sport or being active. We are all about inclusivity, having fun with your work colleagues and meeting like-minded people. Since we launched our all-female team initiative, we have been absolutely delighted with how popular the game has proven to be within the workplace and now with Table Tennis England’s support we have a partner that can help us raise the bar for more women to compete, party and play! The first all-women team will be coached to compete at the next Fight Club taking place in London on June 14. There’s still time for others to get involved at London’s event, or at Manchester, Cardiff and Bristol in the coming months. For those not yet ready to compete in front of a crowd, and preferring to cheer on their colleagues from the sidelines, the event offers a great spectator experience. Alongside the actual competition, there’s VR Ping Pong, a DJ, face painters on hand for ‘battle scars and butterflies’, a summer terraced ping pong BBQ, prizes including the chance to win a Tsingtao Beer pro tennis table, as well as the new ‘Style Awards’ and ‘Best Supporters’. Any London businesses interested in entering a team and attending the Ping Pong Fight Club can do so by registering here. Table Tennis England recently published a Good Practice Guide on Increasing Female Participation. The publication followed extensive research into the barriers that prevent females playing. This research highlighted the importance of social playing for helping to get women active. The publication can be found here. Clubs and Leagues still have just over a week to apply to be part of Table Tennis England’s Be TT programme. The support programme for PremierClubs and Leagues is designed to build better experiences across our sport and one of the three areas of focus, based on insight into playing habits around the country, is developing female participation. Table Tennis England has published a Best Practice Guide on Increasing Female Participation to guide Clubs and Leagues planning to focus on that area. The guide helps clubs to understand barriers which may prevent women and girls from playing and how to remove them, guidance on how to engage women from different age brackets and create sessions tailored for women, plus case studies from clubs and leagues which have successfully introduced more female players to the sport. Click on 'pdf' to view the Good Practice Guide on Increasing Female Participation. Click on 'pdf' for more information on Be TT, including how to apply. Click on the attachments below for more guidance on how this is likely to affect your club, league or county. Also click here to visit the Sport & Recreation Alliance online GDPR toolkit: follow the link :- Link. POOLE'S Sophie Barcsai won the under-11 girls' title at the English Schools' Table Tennis Championship in Wolverhampton. The nine-year-old took the title thanks to a 3-2 win over top seed Maliha Baig in a high-quality final. The Dorset ace's semi-final clash saw her battle back from 2-0 down against Kate Watkinson to win a tight encounter 3-2. Barcsai, who attends Baden Powell School, said: "I wasn't sure I could win but all the support from people helped me. It's the best thing I've won." Youngster Barcsai claimed bronze at the event last year and still has two campaigns remaining at her present age group. She also won gold and bronze at the Primary Schools' international in Scotland. She remained unbeaten in the team event, leading England to victories over Ireland, Scotland, Wales and Guernsey. In the singles, she was the best England girl, reaching the semi-final and winning bronze. Our Sophie had good results in her first Schools' International. This was the Primary Schools' International played in Scotland on the 6th to 8th April. She helped England to comfortable victories in the team event over Wales, Scotland and Guernsey all 10 -- 0 and Ireland 9 -- 1, to take the gold. In the singles she cruised through to the semis (the furthest of any of the other English girls) where she lost to the Irish girl Rachel Taylor to take a Bronze medal. It should also be pointed out that Sophie is only just nine years old and has 2 more years playing in Under 11 events. JESS Moggeridge took part in the National Cup in Grantham in the under-12 event. Moggeridge, who attends Budmouth College, will compete thanks to her being sixth in the national rankings. The format of the competition sees the top 10 players in the under-12 and under-15 age groups play each other in a round-robin competition. After two days and nine matches, the player with the most points wins the competition. The 11-year-old has played an important part in Weymouth’s strong showing in the National Cadet League for the last two seasons and she made her debut aged nine. She played in the top division last season and gained invaluable experience and picked up notable victories along the way. The Weymouth youngster has also travelled across the south to venues such as Plymouth, Horsham and Slough, playing in under-13 and under-15 events with some success. This season has also seen a call-up to the Dorset Cadet County team and a successful run in the Budmouth girls’ under-13 team who are county and south west zonal champions and a visit to Wolverhampton in April awaits in the English Schools finals as Dorset under-13 girls’ champion. Weymouth are looking for new players aged eight and upwards to join their boys and girls’ squads. For more details, contact Millar either at a.millar212@gmail.com or by calling 07710507075. JESS Moggeridge competed in the under-12s National Cup in Grantham, Lincolnshire, and after a disappointing first day, bounced back to impress on the second. The National Cup is a round-robin competition played between the top-10 players in the country at the under-12 and under-15 (cadet) age groups, and the quality of the players on show was high. Unfortunately illness affected the Budmouth School pupil early on, but she battled through and completed all of her matches. Despite some really close legs, including a 17-15 reverse, Moggeridge went on to lose all five matches. This included an entertaining 3-1 defeat to eventual runner-up Bethany Ellis and also a 3-1 defeat to highly-rated Katie Bates. Her second day started with a 3-0 defeat to the top seed from Nottingham, Anna Green, but already Moggeridge was looking more confident than the day before. This showed in the next match against Annelise Williams in which the Weymouth youngster only dropped four points in a 11-1, 11-2, 11-1 win. Two more wins followed against Kate Watkinson and Sophie Richardson as Moggeridge finished the second day with three victories out of four and an overall eighth-placed finish. Green and twin, Connor, won the under-12 titles, while Amirul Hussain from Oldham and Ruby Chan of Harrogate took the boys’ and girls’ cadet titles respectively. Hot off the press. Both Logan Macey and Felix West have qualified, in 3rd and 4th place, for the South West in today's tournament in Plymouth in the Under 11 age category. Matt Ware Qualification, English Championships. Happy to let everyone know of Matt's Qualification for the World Championships of Ping Ping for the fourth year running by winning the English closed today, 07.01.18. This next bit reported by Matt's Father; Geoff Ware. Matt missed the AFCB match against Wigan ( I had bought him a ticket) as he was too late and getting very little sleep that night decided to GO AHEAD and try to qualify for the World Championships of Table Tennis on Sunday 7th January (England hard bat qualifier in Batts Essex). Not only did he get there and play being jet lagged with little sleep, Matt actually WON the event and has qualified with Chris Doran and Andrew Baggaley to represent England at the WCPP event in Alexandra Palace on Saturday?Sunday 27th/28th of January being televised on Sky Sports! (This will be the 4th year consecutively he has qualified)..........so you are all most welcome to come along and support him if you can that weekend. Make sure you tune in to watch the Championships live on Sky Sports at Alexandra Palace on the 27/28 of January. Also taking part were:- Finn Morgan-Bayliss; Ali Malloch; & Kai Major, but unfortunately neither Ali nor Kai got through their Group Stages. The following "pdf's" are provided by Dean Morgan; Images taken from Facebook postings. No Image of Kai Major available at present. Matt Ware @ English Championships. Matt Ware @ WCPP; Batts TTC. Finn Morgan-Bayliss, at English Championships. Ali Malloch @ English Championships. Current List Of Suspensions 2017. Table Tennis England has released an updated list of coaches and players who are currently suspended. It includes the date and length of suspension, whether they are also suspended from coaching activities and their last known county. The list was formerly circulated to national councillors and league secretaries every quarter, but it is felt more appropriate for all clubs, leagues and members to be able to more readily access the information to ensure they do not deploy coaches who are suspended. It is your Dorset County Committee's wish that your league should look to adopt most or all of the Active Dorset Safeguarding Adults Documents below, as a matter of course. See County Website :- "County Welfare" & "County News" pages. TTE Membership fees for 2017/18 announced. Following approval at the AGM, Player Membership will cost :- £14 for Seniors and £7 for Cadets or Juniors. Player Licence will be :- £36 for Seniors and £18 for Cadets or Juniors. Associate Membership will continue to be free of charge. Everyone who held an Associate Membership last season will be automatically renewed for 2017/18. Associate members are not eligible to play competitive table tennis, but can play at their clubs or socially. More information about membership will be released in the coming days. Author: Jamie Gordon Publish date: July 10, 2017, taken from the TTE Website. It was agreed that County League Affiliation Fees to the Dorset TTA are unaltered at £14.00 for 3 person team and £10.00 for 2 person teams for season 2018-19. It should be noted that all Players eligible to play in any affiliated League Team, MUST be TTE Registered for that forth coming season. Associate members are not eligible to play competitive table tennis, but can play at their clubs or socially, as per TTE / ETTA Ruling. UKCC Level 3 Coaching Award Now Open For Applicants: The deadline for applications is August 30th 2017 with the course due to commence on November 11th and 12th 2018 at the University of Gloucestershire. Information should be on TTE website but If anyone needs more information direct them to Aled Howell. Be TT Club and League Developement. The Club is delighted to announce that it has achieved Clubmark Re-Accreditation after six weeks of hard slog led by Club Treasurer & Press Officer Malcolm Floyd. Clubmark is Sport England’s national accreditation scheme for high quality community sports clubs and stands for higher standards of welfare, equity, coaching and management. It shows that a Club provides the right environment which ensures the welfare of members and encourages everyone to enjoy sport and stay involved throughout their lives. It means that parents can rest assured that their children will be in a safe environment within a well-managed club. Another benefit of Clubmark is that many funding bodies state that applicants must have the accredition to be eligible for funding support. The Club was congratulated by Table Tennis England, its National Governing Body, for the high quality and speed of its submission. We think that 6 weeks must be some kind of a record, but this is yet to be confirmed by Table Tennis England. Malcolm would like to thank the officers and committee members for their help and support in this magnificent achievement, particularly club chairman Steve Hemmings. The Club initially acquired the prestigious Clubmark status in August 2010 and gained its first re-accreditation in March 2014. We have just found out that accreditation now only last two years instead of three years, which reflects the increasingly higher standards expected from clubs. In addition to being an “Ability Club” (Actively working with disabled people), the Club is also a 4-Star Premier Club, the highest rated club in the Bournemouth & District league. Clubmark accreditation is mandatory to achieve a star-rating. We are always on the lookout for new members, from experienced players to absolute beginners, but would particulary like to attract more junior and lady members. Anybody interested in joining our very friendly club, or who would just like a bit more information, should contact Club Secretary Bev Scott-Johns on 01425 619552. Following the nomination by Malcolm Floyd, Bev Scott-Johns is to receive a Torch Trophy Trust Award for his outstanding voluntary work on behalf of the New Milton Table Tennis Club and the Sport in general. This award which was supported by Table Tennis England, will be presented at the 55th Annual Torch Trophy Trust Awards ceremony at the Army and Navy Club, Pall Mall, London on 7th March by HRH The Duke of Gloucester. The Torch Trophy Trust is a charity that rewards, recognises and supports volunteers in sport and recreation, and recognises the achievements of some of the UK’s most outstanding volunteers in the annual Torch Trophy Trust Awards, presented by a member of the Royal Family. This year, the Trust intended to recognise 20 outstanding volunteers across sport, so Bev will be amongst a very select few. It is anticipated that Sara Sutcliffe, Table Tennis England’s CEO, will be present at the ceremony, along with other luminaries, to watch Bev receive his award, which he richly deserves. Active Dorset :- About Us. We are one of 44 County Sports Partnerships (CSPs) across England, committed to working together to increase participation in sport and physical activity. County Sports Partnerships work across the sporting landscape in their county, actively supporting partners to increase participation in sport and physical activity. Sport England invests Core Funding into CSPs to provide a set of core services to strengthen the local delivery of National Governing Body of Sport (NGB) Whole Sport Plans and support the achievement of NGB and Sport England targets. This investment seeks to increase the number of people aged 14 plus playing sport each week across England. We run a wide range of programmes such as Sportivate and the Dorset School Games throughout the county, which aim to increase participation and we help to support the work of clubs, coaches, volunteers, educators and facilities. Our partners include NGBs and their clubs, all tiers of the education sector, local authorities, sport and leisure facilities, the Health sector and many other sporting and non-sporting organisations. Through working with these partners we do all we can to get Dorset active. As a Community Interest Company we are committed to reinvesting any surpluses we generate back into local opportunities for sport and physical activity. We periodically issue a newsletter, which can be read from the 'pdf' file/s above.